NASHVILLE, TENN. – Music buyers take a stand to show that Traditional Country Music hasn’t gone anywhere. It’s loved, alive, and well, as the incredible new project American Grandstand landed its first week on Billboard’s Top Current Country Albums chart at No. 10. It is No. 1 on the Billboard Bluegrass Chart, and No.1 on Billboard’s Heatseekers Album Chart for the week of July 29, 2017. Not since George & Tammy and Conway & Loretta has there been a vocal duet performance like Rhonda Vincent & Daryle Singletary. This week marks yet another indication that buyers love the authentic, unaltered voices of two of the greatest singers in this generation of country music. 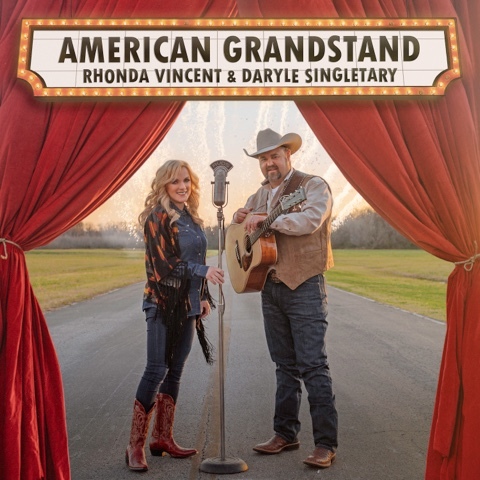 “The New Queen of Bluegrass” Rhonda Vincent and country hitmaker Daryle Singletary share their thoughts as they celebrate being at the top of the charts! This chart-topping project was released on Upper Management Music, and features 12 amazing songs; with originals like the title song written by Rhonda Vincent, along with country classics like the first single “One,” that was written by hit country writer/performer Ed Bruce and originally performed by country legends George Jones and Tammy Wynette. This dynamic duo is off to a blockbuster start, with rave reviews, and a momentum that started with their numerous Nashville performances at the CMA Music Fest, Music City Roots, and The Grand Ole Opry. “American Grandstand” is available now at AmericanGrandstand.com and wherever music is sold. Fans can catch “The Most Award-Winning Band in Bluegrass Music History” Rhonda Vincent & The Rage on the road throughout the remainder of the year, as the IBMA “Entertainer of the Year” and 8-time “Female Vocalist of the Year” winner makes stops at festivals and venues throughout North America, plus a return visit to Europe’s Bluegrass Capital - Prague, Czech Republic www.rhondainprague.cz in September, along with a stop at Switzerland’s Most Prestigious Country Music Festival in beautiful Gstaad.